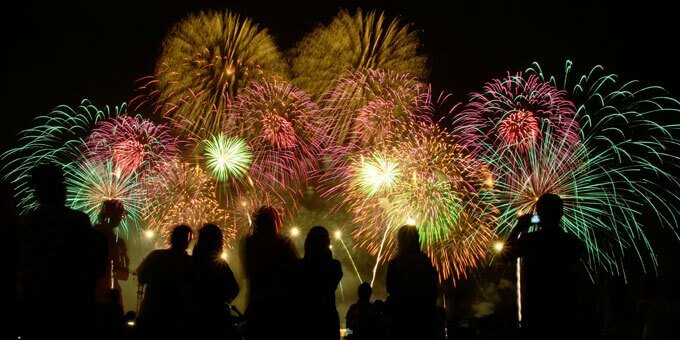 Skip the headache of going into D.C. on Independence Day, and check out these eight easy-peasy places to watch 4th of July fireworks in Northern Virginia! We all know the D.C. fireworks are da bomb, but how many of us feel like sitting in hours of traffic into and out of the city to see them up close? These eight spots to watch Fourth of July fireworks in Northern Virginia are the shiznit, too! Grab your blanket, kick back, and enjoy the show at the locale nearest you! Gates open at 6 p.m., and the rock band Turtle Recall will perform at 7 p.m. The fireworks show begins at 9:20 p.m., with seating available at Jack Gambill Athletic Fields and the Northern Virginia Graduate Center Parking Lot. Food trucks will be handy, including Margaret's Soul Food, Los Wingeez, and more. Visitors are encouraged to take advantage of free parking at the West Falls Church Metro station parking garage. Parking at the school is available only to event personnel and visitors with handicap signs. The City of Fairfax celebrates the Fourth by hosting its annual Independence Day celebration, featuring a parade from 10 a.m. to noon, free guided tours, and a superhero fest, followed by live music and a fireworks show at 9:30 p.m. Pets, alcohol, and smoking are not allowed at the evening show. This fest is actually not on the Fourth. The city will hold its celebration July 7 to celebrate America's 242nd birthday and Alexandria's 269th birthday on the same day. The event will be held from 6 p.m. to 10 p.m. with live music, food vendors, patriotic birthday cake, and an awesome fireworks display over the waterfront at 9:30 p.m.
Free games and other activities begin at 6:30 p.m. on the Fourth, with festival food available for sale. A live performance by E3 starts at 7:15 p.m., all leading up to the fireworks show at 9:30 p.m. Parking is available at Herndon Middle School, Herndon Centennial Golf Course, and Herndon Community Center. Those parked at the Herndon Community Center may not exit until given permission by the Fire Marshal. Personal fireworks, glass containers, and pets are not allowed. The rain date is July 5. George Washington's estate will host a variety of celebrations on and leading up to Independence Day. On June 29 and June 30, from 6 p.m. to 9:45 p.m., guests are invited to enjoy a patriotic evening filled with fireworks (which start at about 9:30 p.m.), mansion tours, musical performances, old-fashioned ice cream, and more. Food trucks will be available from the Mount Vernon Inn Restaurant. Tickets for the fireworks show plus the mansion tour are $35 for adults, and $25 for children ages 6 to 11. Tickets for the fireworks show only are $30 for adults and $20 for children ages 6 to 11. On July 4, from 8 a.m. to 5 p.m., guests can watch daytime fireworks over the Potomac, military reenactments, a National Concert Band Performance and more. Free birthday cake will be available while supplies last. Discounted tickets online for the event are $18 for adults, $17 for seniors, and $11 for youth. After an Independence Day parade in historic downtown Leesburg at 10 a.m., a fireworks show choreographed to patriotic music will be held at the park at 9:30 p.m. on July 4 (or July 5 if it rains). Gates open at 6 p.m., and music starts at 6:30 p.m. A full food court of food truck offerings will be on hand with funnel cakes, ice cream, burgers, and more. Parking is available at the interior lots off Ida Lee Drive and the festival field parking off King Street. Pets, alcohol, glass bottles, and personal fireworks are a no-no. These fireworks are not on July 4! Fireworks begin at about 9:15 p.m. on June 30 (or July 1 in case of rain). Parking is $10 per car. The park opens at 7 a.m. with several activities leading up to the fireworks, including boat rentals available for a fee at 11 a.m., a puppet show at 1:30 p.m., bands starting at 4:15 p.m. and more. Food vendors will be set up near the park's main office, and campgrounds are available for overnight accommodations. The campgrounds fill up fast, so call the Fairfax County Park Authority at 703-471-5415 to reserve a space. On July 4, guests can enjoy fireworks after dark (around 9:30 p.m.). The evening kicks off at 7 p.m. with Mars Rodeo performing rock originals and covers leading up to the show. Food and drinks will be available at the Little League concession stand. Alcohol and pets are not allowed. With plenty of options, there's no need to go into D.C. this holiday. Hang close and enjoy the Fourth of July fireworks in Northern Virginia! Are you going to one of these NoVA spots on the Fourth? Blow our minds in the comments! Which state do you think is the most patriotic? Find out which one wins, here!